During the last several years, school staff have become well aware that what happens online often significantly impacts the environment at school and the ability of students to learn. It is also true that what goes on at school influences the nature and content of student interactions while away from school. That means that a lack of connectedness, belongingness, peer respect, school pride, and other climate components may very well increase the likelihood of technology misuse off-campus by teens. We also found that teachers who talk about these issues with their students are making a difference. Even though almost half (46 percent) of students said their teacher never talked to them about being safe on the computer and 69 percent of students said their teacher never talked to them about using a cell phone responsibly, when these conversations happen, they seem to have a positive impact. 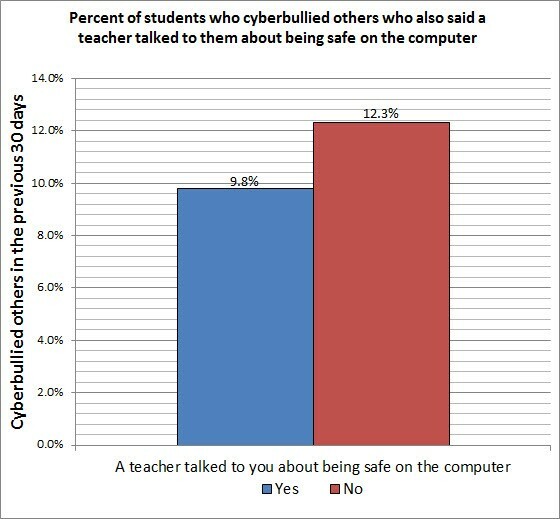 Students who told us that a teacher had talked to them about being safe on the computer were significantly less likely to report cyberbullying others. Also, those who told us that a teacher had recently talked to them about using their cell phone responsibly were significantly less likely to say that they had sent a sext to another student. Of course the content of those conversations is also important. Once again, we call for more research to clarify what works in terms of teachers talking with students about safely and responsibly using computers and cell phones. It is also noteworthy that fewer than 10 percent of targets of cyberbullying told a teacher or other adult at school about their experience (about 19 percent of the targets of traditional bullying told an adult at school). Much of the reluctance of students to report these kinds of behaviors stems from their skepticism that the teacher will actually do anything useful to stop the behavior. In fact, most students we speak to suggest that telling a teacher (or other adult) will often make matters worse. Interestingly, 75 percent of students in our study felt that the teachers at their school took bullying seriously, but fewer (66 percent) felt that the teachers at their school took cyberbullying seriously. So clearly, adults in school have some work to do to convince students that these problems can be resolved effectively. How can a school or classroom hope to have a positive climate if students are afraid or hesitant to talk to adults about these issues? This is just one aspect of school climate that must be corrected if school administrators hope to develop and maintain an environment where youth can freely learn and thrive. In our most recent research, we asked students to tell us how likely it would be for someone at their school to be caught and punished for cyberbullying. In general, about half (51 percent) of the students said that it was likely that a student from their school would be punished for cyberbullying. To note, this number dropped to less than 40 percent among the students who had actually been victims of cyberbullying. 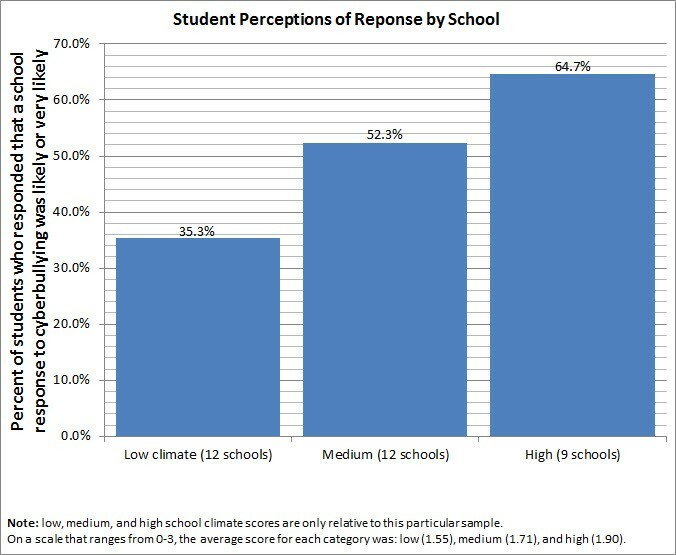 When we examined this question from the perspective of different school climates, we found that students from the schools with more positive climates reported a higher likelihood of a response. Specifically, 65 percent of the students at the schools that scored “high” on our scale said that cyberbullies would be punished at their school compared to only 35 percent of the students at the “low-scoring” schools. Here again, the quality of the climate at school shapes student perceptions of accountability for behaviors online. What is the take home point of this research? Basically, there are fewer behavioral problems and higher academic performance in schools with a positive climate, the influence of climate extends beyond the school walls. Students who feel they are part of a welcoming environment will largely refrain from engaging in behaviors that could risk damaging the positive relationships they have at school. You can’t separate climate from instruction. You can’t separate climate from leadership. You can’t separate climate from the purposeful things you do to build a relationship with students. If a school is doing great on one thing, it tends to all fall in line. Now that we better understand the online experiences of our students, and know that the climate at school is related to those experiences, the next step is to work to transform your classroom and school into a place where students feel safe, respected, involved, and connected. The resources on this site, and our latest book School Climate 2.0 can provide you with a road map for doing just that. Even though it is not an easy path to travel, we are confident that you will not be disappointed when your efforts materialize into happier students and staff and an overall better place to learn and teach. We have worked hard to educate our students and parents regarding online safety. Recently, we added a curricular unit at the seventh-grade level (soon to start in fifth grade). Each grade level participates in activities regarding cyberbullying. Additionally, we have had experts come in and talk to our students, staff, and parents about how to be more aware of online issues and how to respond appropriately. We are currently working on steps to communicate and practice online behavior expectations as part of the overall system of Positive Behavior Interventions and Supports (PBIS) at our school. We try to assist students in resolving cyberbullying issues even if the behaviors did not occur at school. We have had our counselor or trained peer mediators meet with students who are involved in online conflicts to work toward a resolution. As the principal, I have met with several parents to inform (and often educate) them about their child’s online behavior. By confronting the issue, I believe our school climate has improved. Students (and parents) know that we care about them beyond the school walls. They know we believe a safe, bully-free environment is critical to providing the best education possible.